When it comes to commercial spaces wooden venetian blinds are increasingly popular in the market today. They are generally more expensive than blinds made from other materials but there are plenty of good reasons why more and more commercial customers are opting for them. The construction of venetian blinds means they don’t have to be raised in order to allow light into the office. They are designed to allow control over light entering the space without losing the privacy element that is expected of them. Wood is a stylish material that can be used to shut out light, and then let various levels through when you adapt the angle of the blinds. 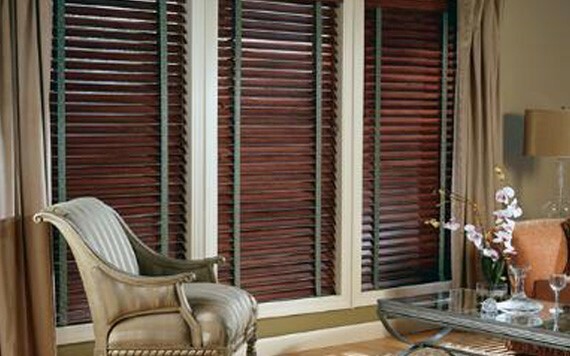 Wooden blinds rarely totally blackout a room, but they can get close. Wooden venetian blinds are preferred in many office spaces because of that touch of class they bring to the environment. In many cases plastic blinds cheapen the feel of the interior decoration of the office, especially where there is expensive wooden flooring and furniture. Wooden Venetian blinds on the other hand will complement the overall style of such workspaces. This is the main disadvantage of wooden Venetian blinds. They collect dust and dirt very quickly and don’t do a very good job of hiding the fact. On the positive side, cleaning dust off wooden venetian blinds is easier than cleaning it off plastic blinds. 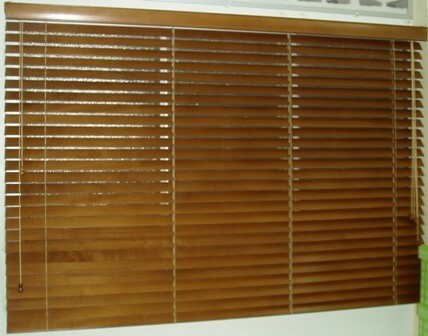 Slats of wooden blinds can be wiped with one hand without dismantling the setup. Since wooden venetian blinds are made from natural materials, it is natural that shades will vary, grain patterns will add character, and each blind will be completely unique. This can either be positive or negative factor depending on what it is you want. If you want uniformity then you will have to do choose very specific wooden blinds, and you will be, to a certain extent eliminating one of the big benefits of this type of commercial blind- character. Although wood is highly durable and will last a long time, if exposed to moisture it can warp in time. If the blinds are treated properly before arriving in shops this is unlikely to be a major consideration, but you should think about it when you’re making your decision. If you are buying bespoke wooden blinds then make sure you have them treated properly so that they do last the long haul. There are lots of positives to wooden blinds in the office environment. We haven’t even touched on the fact that they can create a more natural feeling homely atmosphere. However, if you want cheap ready-made designs then you are unlikely to find them in wood. They can be expensive and so they are a premium choice for the discerning office looking to create a special workspace. This entry was posted in Blinds. Bookmark the permalink. We are an independent family run business specialising in made to measure blinds, shutters and curtains. Homestyle can provide you with a FREE no-obligation quotation.